This is the best of both worlds... Perched above it all in a quiet, urban forested canyon with a 20 minute drive to glorious San Francisco. 7 minutes to BART or CalTrain at Millbrea station. 10 minutes from SFO. Walk to the beautiful Mills Canyon loop trail. Bikes available for loan to ride along the Crystal Springs Reservoir or the Bay. Street parking directly below the Treehouse. 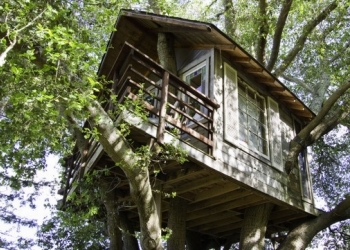 Come nest in our Treehouse, privately situated in a stately Coast Live Oak. Get in touch with your "inner child", your "inner primate"! Suitable for candle-light dinners. Equipped with cable TV and essential DVD movie collection. French doors and stained glass. 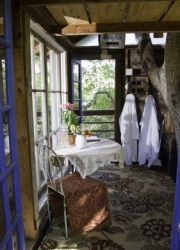 Rocking chair on tree house deck with view of SF Bay. WiFi, lighting and electricity to charge your smartphone. 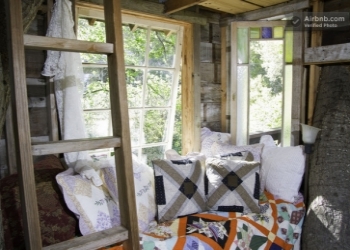 Fluffy duvets/pillows and passive, eco-friendly heating to keep you warm and toasty. This is a four season accommodation. 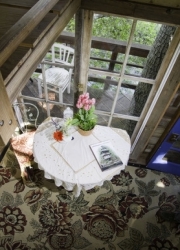 Sleeps 1 on raised lower level bed, 2-3 in queen-size sleeping loft above. 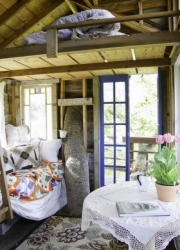 Serenity for 1, ideal for 2 or 3 and sleeps 4 if you reeeeally like each other! 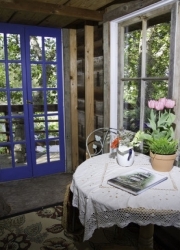 Private access to adjacent indoor bath, shower & kitchenette in lower level of family log cabin home. Secluded, wooded property on cal-de-sac street. Family organic vegetable/herb garden, greenhouse and chicken coop in backyard. Would love to share this with you during your visit. Continental breakfast with fruits, breads, coffee/tea and fresh organic hard-boiled eggs!